I love everything about living in the Midwest. Yes, even the snow. I find the change of seasons invigorating. There is the beauty of snow in winter, planting a garden in the spring, harvesting and preserving in the heat of summer, and awaiting the first fall colors, which are all energizing to the soul. But many have the misconception about the food of America’s heartland; that it consists mainly of meat-and-potatoes. Not that there is anything wrong with that. I still love my mother’s meat loaf. 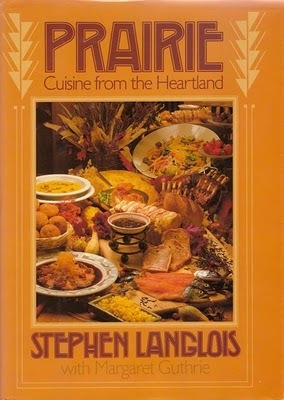 But Stephen Langlois, author of the 1990 cookbook, Prairie: Cuisine From The Heartland, will convince you that midwesterners do not actually subsist on deep-dish pizza and Italian beef sandwiches. He takes the bounty of Midwestern foods to new heights. Chef Langlois had a very intriguing concept about creating his restaurant in Chicago, named, of course, Prairie. He wanted to honor Frank Lloyd Wright’s architectural contribution to the world and highlight the best of Midwestern food and culinary heritage at the same time. He asked himself – What is traditional Midwestern cooking all about? Was it anything more than meat-and-potatoes? To answer some of his own concerns, Chef Langlois made a trip to the library. He discovered that, indeed, the Midwest has the “homey” style of cooking that has been prevalent in this part of the country for generations, and that Frank Lloyd Wright’s unique approach to his work provided the perfect way for him to showcase this well-established cuisine. He came to the conclusion that Wright’s philosophies need not be applied strictly to architecture. Wright’s tremendous respect for nature motivated him to combine the building materials found on a given job site, using traditional design techniques. Chef Langlois believed this concept could easily be translated into culinary terms. After all, he says, what is regional cookery but the combination of indigenous ingredients with the traditional cooking techniques of a certain region? He believed that Wright’s architecture can be defined as regional in character with traditional values, yet at the same time be completely modern and timeless. It was with this philosophy in mind, that Chef Langlois set out to redefine Midwestern cooking. And lucky for all of us, he did. Chef Langlois took a year to travel throughout the Midwest in search of the best possible food suppliers. He found morels, venison, and dried fruits from Michigan; wild rice from Minnesota; duck, buffalo, and cheeses from Wisconsin. Indiana turned out to have a native gem – persimmons. Ohio is a top producer of tomatoes, and Illinois offered pumpkins. He also visited State Fairs in order to find blue ribbon pies, ate in rural cafes, and searched old church cookbooks. He wanted the menu at his restaurant to be traditional and wholesome, yet updated and light enough to appeal to today’s tastes. The first chapter is breakfast dishes with everything from Baked Apple Pancake, Old-Fashioned Corned Beef Hash, Yeast Waffles with Stewed Blueberries, to my favorite, a Prairie-Style Eggs Benedict with Cheddar Cheese Hollandaise. I am a sucker for any kind of Eggs Benedict. I am also a fan of homemade yeast breads and he doesn’t disappoint. Since I have so many chives in my garden, I also look for ways to use them. The Wisconsin Cheddar Cheese and Chive Drop Biscuits fit the bill. The Buckwheat Honey Bread was a recipe from a woman Chef Langlois met at the Iowa State Fair. How about some Cider-Squash Bread served with apple butter? Besides being an Eggs Benedict fanatic, I am also a potato salad junkie (which will be a whole future blog in itself!). I am always in search of the next, great potato salad. The Amish Potato Salad was found by Chef Langlois in a rural Indiana cafe, made by an Amish woman who lived down the road. Basically, it’s a chunky, basic potato salad tossed in a light mustard dressing infused with bacon and celery seed. Frank Lloyd Wright would have been proud..